WASHINGTON — House Judiciary Committee Chairman Jerrold Nadler has indicated time and again that he is nowhere near beginning an impeachment process against President Donald Trump, a process that would unfold in his committee. 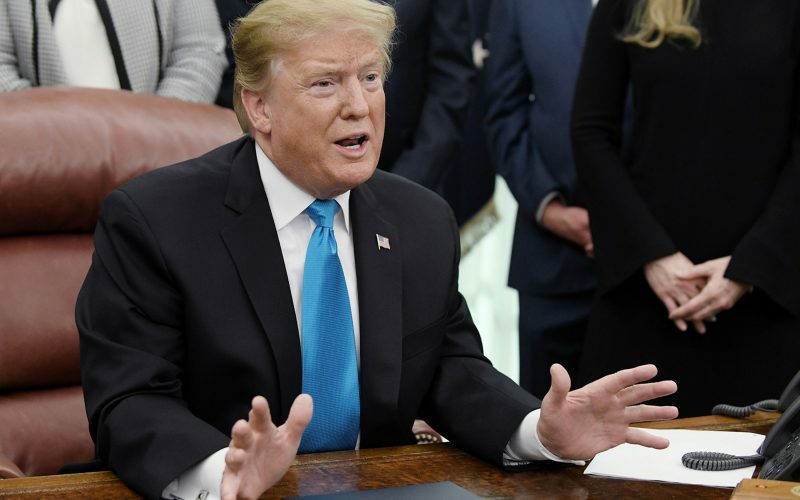 The New York Democrat has said that while he believes the president may have committed high crimes and obstructed subsequent investigations into them, his assessment of the facts isn’t the one that ultimately matters. Before he can do anything, Nadler believes, he needs to convince the American voter that Trump does in fact deserve to be impeached. If Nadler thinks Trump committed crimes, why not begin impeachment? Nadler considers himself not just a legislator but a scholar, people who have known him for years have told Roll Call. Nadler made a brief but high-profile appearance in the national spotlight as one of President Bill Clinton’s fiercest defenders during the 1998 impeachment proceedings. Nadler was one of the first lawmakers of his time to argue to the public that there is a difference between crimes and impeachable offenses. As the longtime top Democrat on the Judiciary Subcommittee on the Constitution, Civil Rights, and Civil Liberties before becoming ranking member of the full committee in 2015, Nadler has honed a three-pillared political philosophy of impeachment. He has laid out that philosophy in detail in countless media interviews — first with Roll Call — since Democrats won back the House last November. The third and potentially most relevant pillar of Nadler’s philosophy down the road is that presidential impeachment is, inherently, a political measure. House Democrats could have all the evidence in the world that Trump committed what they consider an impeachable offense. But if people who voted for Trump in 2016 don’t agree, impeaching the president is not appropriate, Nadler said. “It is a very high bar,” Nadler admitted Sunday. No Republican lawmakers to date have signaled they are open to impeaching the president, suggesting that the notion remains unpopular among GOP and independent swing voters. It could prove difficult to sway public opinion. Just 37 percent of registered voters found former Trump lawyer Michael Cohen’s blockbuster to be credible in his testimony before the House Oversight Committee last week, according to a new poll from HarrisX and The Hill. Twenty-five percent said Cohen was not credible, while 39 percent said they did not have an opinion. Those numbers suggest Cohen’s testimony — in which he sought to implicate the president, his two oldest sons, and the chief financial officer of the Trump Organization in multiple crimes — did little to move the political needle. Nadler’s aides have emphasized to Roll Call that the chairman views educating the public — through hearings, TV interviews, released transcripts — as one of Congress’ primary responsibilities. Throughout the next two years, House Democrats will continue holding hearings with former Trump associates to persuade voters that the president did indeed commit crimes. Felix Sater, who orchestrated ultimately unsuccessful negotiations for a Trump Tower in Moscow while Trump was the GOP nominee for president in 2016, will testify in an open House Intelligence Committee hearing next week. Democrats on the Oversight and Intelligence Committees have said they want to bring in Allen Weisselberg, the Trump Organization CFO and possibly members of the Trump family. Only if Democrats can build what they believe to be a strong public record against the president — one that even a significant portion of the president’s strongest advocates cannot deny — then Nadler will consider moving forward with impeachment, he has indicated. Nadler and the Democrats want to avoid stepping on the same rake Republicans did in 1998, when then-Speaker Newt Gingrich plowed ahead with plans for impeachment proceedings against Clinton for perjuring himself regarding his affair with White House intern Monica Lewinsky. Republicans suffered a five-seat loss in the House in those midterms, a poor performance that historians and political commentators attribute to the House GOP’s bullishness against Clinton. What’s the immediate next step? Nadler on Monday sent letters and document requests to a range of people and groups involved in Trump’s 2016 campaign, inauguration committee, administration, and personal business dealings. The Judiciary Committee will be probing possible obstruction of justice and corruption by Trump and his associates, Nadler announced. The document requests Monday targeted such high-profile people in Trump’s orbit as convicted former campaign chairman Paul Manafort and the recently indicted political consultant Roger Stone. The president’s eldest sons, Donald Jr. and Eric, are on the list, along with Trump’s son-in-law and senior adviser, Jared Kushner. One Trump notably absent from the list is the president’s daughter and adviser, Ivanka. “We have sent these document requests in order to begin building the public record,” Nadler said in a statement accompanying the letters. Trump contended Monday he intends to cooperate — to some extent, at least — with House Democrats’ demand for information. How will Republicans react to this? Republicans have long seized upon the specter of Democrats impeaching Trump as a cudgel against them on the campaign trail. Billionaire progressive donor Tom Steyer, who spent $123 million of his own money to mobilize young Democratic voters in the 2018 cycle, has also spent millions on a highly publicized “Need to Impeach” campaign against Trump. At the public Cohen hearing last week, Oversight Committee ranking member Jim Jordan of Ohio invoked Steyer in his opening remarks to portray Democrats’ investigations into the president’s affairs as motivated by pressure from left-wing progressives. And after Nadler requested documents from the 81 Trump-related associates and entities, Jordan fired off a tweet — that has been scorned as anti-Semitic — where he accused Nadler of succumbing to pressure from “Tom $teyer” to impeach Trump without evidence. Both the White House and Republican lawmakers have sought to undermine the credibility of Democrats’ investigations, labeling them as politically motivated, unrelated to Trump’s governing, and reliant upon testimony from convicted felons like Cohen. “It’s laughable that anyone would take a convicted liar like Cohen at his word, and pathetic to see him given yet another opportunity to spread his lies,” White House press secretary Sarah Sanders said in a statement last week, ahead of the testimony.